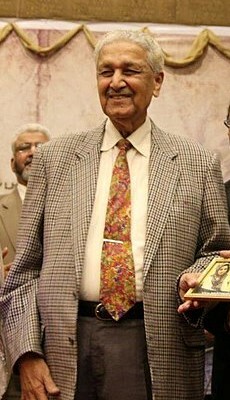 Abdul Qadeer Khan, more commonly known as A. Q. Khan, is a Pakistani physicist. Khan was born in 1935 or 1936 to a Muslim family in Bhopal, India. In 1952, the Khan family moved to Pakistan. As a young man, Khan went to Europe to study at the Technical University of Berlin. He later earned a master’s degree from Delft University of Technology and a Ph.D. in metallurgical engineering from the Catholic University of Leuven. In 1972, Khan went to work URENCO, a nuclear fuel company, on uranium enrichment plants in the Netherlands. After India tested its first atomic bomb in 1974, Khan contacted Pakistani Prime Minister Zulfikar Ali Bhutto to offer his services for the Pakistani nuclear program. Khan stayed in the Netherlands for another year to gather information before returning to Pakistan in December 1975 along with stolen gas centrifuge blueprints. The Dutch government opened an investigation into Khan and sentenced him in absentia to four years in prison, although it was later overturned on appeal. Upon his return to Pakistan, Khan established a new laboratory in Kahuta—later renamed the Khan Research Laboratories (KRL)—to develop highly enriched uranium (HEU). Khan’s nuclear rival was Pakistan Atomic Energy Commission (PAEC) Chairman Munir Ahmad Khan, who at the time led efforts for a plutonium bomb. “Munir Ahmad Khan and his people are liars and cheats,” Khan wrote to Prime Minister Bhutto. “No work is being carried out, and Munir Ahmad Khan is cheating you.” Although Munir Ahmad Khan maintained his role with PAEC, Bhutto soon granted A. Q. Khan virtual autonomy over his uranium production program, codenamed “Project-706.” The Kahuta gas centrifuge plant produced its first HEU in 1982. During the 1970s and 1980s, Khan purchased centrifuge parts and equipment from Europe, including his many contacts in the Netherlands, Germany, and France. Khan, however, purchased twice as many centrifuge parts as he needed. Over the next several decades, he sold this equipment on the nuclear black market to Iran, North Korea, and Libya. Blueprints for the Chinese uranium implosion bomb later turned up in Libya in a dry cleaning bag from Islamabad. There is also evidence that Khan offered to sell nuclear technology to Iraq before the First Gulf War, but was rebuffed by Saddam Hussein. The United States had long suspected Khan of proliferating nuclear materials but did not learn the full extent of his network until 2003, when U.S. agents intercepted the BBC China, a German cargo ship, en route to Libya. The ship contained parts for 1,000 gas centrifuges, allegedly at a $100 million price. In December, Colonel Muammar Gaddafi agreed to dismantle Libya’s nuclear program and named Khan as its supplier. In February 2004, Khan publicly admitted to selling nuclear materials on the black market and offered his “deepest regrets and unqualified apologies.” Under pressure from the United States, Pakistani officials placed Khan under house arrest. He was released in 2009. Despite his controversial career, the majority of Pakistanis view Khan as a national hero who advanced science, technology, and security in Pakistan. Khan has also received an extraordinary number of awards, including forty-five gold medals, three gold crowns, and twice the Nishan-i-Imtiaz, Pakistan's highest civilian honor. 1961 Moved to West Germany to study at the Technical University of Berlin. 1972 Earned a Ph.D. in metallurgical engineering from the Catholic University of Leuven in Belgium.